A few customers have written me to report that Script Debugger 4.5 takes much longer to open their scripts than did Script Debugger 4.0. This slowdown is an unintended consequence of a new feature in Script Debugger 4.5 where Script Debugger warns you that opening a script will cause other applications to be launched. This slowdown is most dramatic when opening scripts that target applications which have very large AppleScript dictionaries such as Adobe InDesign, Adobe Illustrator, or Microsoft Word. Generally the delay should only be felt the first time Script Debugger 4.5 reads the dictionaries for these applications. If Script Debugger is left running, it will reuse the dictionary information cached in memory. 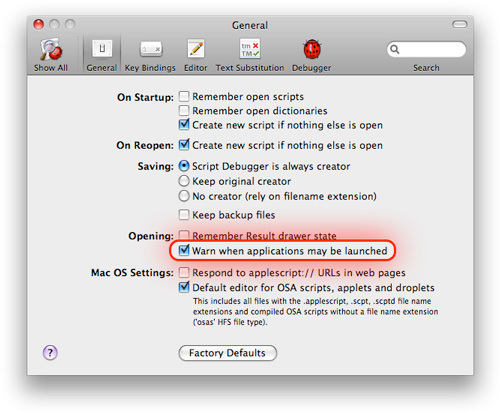 Script Debugger 4.5.1 introduced a new ‘Opening: Warn when applications may be launched’ setting in the General Preferences panel that allows you to turn off the application launch warning when opening scripts. If the delay opening your scripts is slowing down your work or if the warning becomes irritating, you can use this preferences setting to disable the feature.